In the current smartphone and tablet era, the Mobile Business Intelligence (BI) solution is gaining increasing attention among the worldwide business community. The consumerization of IT has disrupted several facets of our daily lives, including the use of mobile devices in the workplace. Organizations need to have a mobility strategy in place to stay competitive, which includes Mobile BI. According to Boris Evelson, VP and Principal Analyst at Forrester, “Mobility is no longer a ‘nice to have’ – it will (be) the new BI mantra.” Execs and employees alike cannot wait to make decisions until they are in the office and in front of their PCs. Evelson also states that 24 percent of enterprises already use or are piloting Mobile BI applications, and 37 percent are considering Mobile BI for near-term implementations. The amount of data on the planet is set to grow 10-fold in the next six years to 2020 from around 4.4 zettabytes to 44ZB. That’s according to IDC’s annual Digital Universe study, which also predicted that, by 2020, the amount of information produced by machines, the so-called Internet of Things, will account for about 10 percent of data on earth. According to IDC, it includes not only the increasing number of people and enterprises doing everything online, but also all the “things” – smart devices – connected to the Internet, unleashing a new wave of opportunities for businesses and people. The whole world is floating in the massive amount of data, and mobile is driving the latest volume surge. Worldwide, there are more than six billion mobiles phones in use. Global mobile data traffic grew 63 percent in 2016. Global mobile data traffic reached 7.2 exabyte’s per month at the end of 2016, up from 4.4 exabyte’s per month at the end of 2015. Worldwide, smart devices represented 46 percent of the total mobile devices and connections in 2016; they accounted for 89 percent of the mobile data traffic. In 2016, on an average, a smart device generated 13 times more traffic than a non-smart device. According to Cisco Systems Inc., the explosion of mobile applications and adoption of mobile connectivity by end users is fueling the growth of 4G, soon to be followed by 5G growth. Cisco and other industry experts anticipate large-scale deployments of 5G infrastructures to begin by 2020. Mobile carriers will need the innovative speed, low latency and dynamic provisioning capabilities that 5G networks are expected to deliver to address not just increasing subscriber demands but also new services trends across mobile, residential, and business markets. Cisco forecasts that 5G will account for 1.5 percent of total mobile data traffic by 2021 and will generate 4.7 times more traffic than the average 4G connection and 10.7 times more traffic than the average 3G connection of a non-smart device. The big data generated by the customers’ activity is being harnessed by businesses to improve their productivity, improve ad targeting and connect with their customers in a more effective way. Businesses small and large have started incorporating Mobile BI as part of their core business strategy. 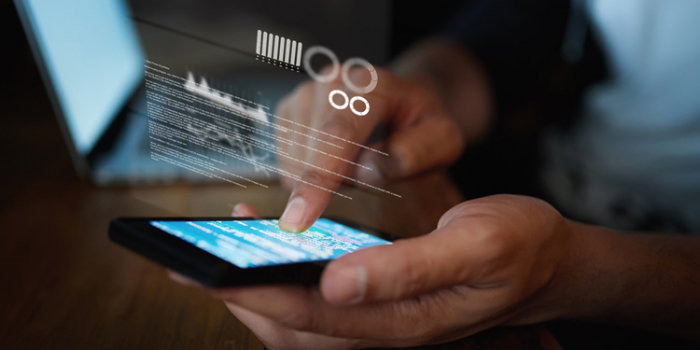 When considering the utilization of Mobile BI, it is imperative to comprehend who exactly the target users will be in order to produce the most effective application by examining the core elements the users will require. There also must be a recognition of the tools necessary to most effectively assist employees in the performance of business practices. Mobile BI which can benefit the organization as a whole, from the Chief Executive Officer to sales staff. Differences in design must be considered based upon the type of devices used. Tablets and smartphones are quite different in the time and action for which they are used. Smartphone users often view data very quickly, while tablet users take time to perform more reading and engagement with data. Mobile BI should be designed with device and user compatibility in mind for the most benefit and use of data. Mobile BI will have the capability to maintain evolving information in real time. A user will have the ability to check movement instantly in the stock market, have alerts and push notifications, along with the latest elements of security and design. The user experience will be at the forefront of Mobile BI design with actions geared toward data-driven abilities, resulting in more efficient and swift business activities, particularly in the realm of smartphone usage. As soon as a business user receives an alert or notification, the individual has the ability to make immediate decisions, along with sharing and collaborating with others in order to perform best business practices. Charts, graphs and other visual aids can be exchanged and shared instantly. Data feedback loops leads to improvement of performance by diagnosing issues as soon as they occur. In the realm of business, most intelligence structures are cloud-based. As such, there is easy accessibility from anywhere synced with any type of device. Customer information can be pulled instantly when customers register your webpage on their mobile device or pay a visit to your webpage. Through the cloud, one is able to interpret customer behavior along with their attitudes surrounding your products. Mobile BI has the capability to allow temporary, intermediary and permanent access to data for as many employees as you want. This enhances better decision-making processes through the use of key business analytics to facilitate increased sales and ROI for the company. Access to real-time data has a profound and positive impact on enhanced operational efficiencies along with smooth and cohesive decision making. Mobile BI will assist those with a limited acquaintance with tech to be able to call up information required swiftly, thus avoiding obstacles to efficient business practices and decisions. Productivity improves exponentially when the data is within reach by the touch of a screen. Sales representatives will have the ability through Mobile BI to access timely information in order to provide customers with the latest statistics or products associated with their business. This also benefits the customers by building confidence in the products and be more open to engaging in business with a company on the spot. Exception reporting will allow mobile workers to make fast decisions in the event of any unforeseen circumstances. Mobile BI gives businesses the choice to be more flexible to the needs of customers and to stay competitive. Workers with Mobile BI are able to cross-sell/up-sell and react to fluctuating market trends through the accessibility of real-time data. Sales teams no longer have to rely on one another for information as Mobile BI now provides company, documents, data, current numbers and examples which help broker on-the-spot deals by pulling up all the information a customer needs. The capability to collaborate with colleagues long-distance and keep strong connections with core business activities and central operations remains intact. The cost of overhead is reduced greatly due to employees not having to be on-site (paperless offices) and through improved use of enterprise applications since the users are more apt to utilize mobile applications in lieu of desktop applications. There are many reports of late surrounding breaches of security which may make companies apprehensive about implementing Mobile BI. Aspects of security such as authorized and authenticated access to enterprise data, dedicated/secured BI servers along with secured data storage need to be a component of every Mobile BI protocol. The BI application should adhere to existing security blueprints of the organization, all devices should be equipped with automatic lock-out systems when inactivity is detected and high levels of encryption should exist in BI tools with data flowing between servers and devices. Validity and scalability with data of Mobile BI should have effective strategies in place as more and more users have access of data through a variety of devices. The integrity of Mobile BI data is maintained through the use of a dedicated BI team in charge of keeping the BI application environment secure and monitoring the integrity of the data sources. A consideration should be kept in mind for usage requirements, patterns and habits of mobile consumers while designing the applications for the best Mobile BI experience possible by acknowledging the mobile features along with the sizes of the devices themselves. Instead of squeezing entire blocks of information on a small screen, the application designer should provide pathways for the user to go on in order to drill down to the specific information the user is looking for. Is Mobile BI right for me? Mobile BI is growing at a very fast rate of speed. The 2014 report from Accenture Mobility Insights reports that 77 percent of participants have mobility listed as one of their top five priorities for effective business practices! Have you already adopted Mobile BI in your organization? Now there are some disadvantages to Mobile BI, and it may not be a good fit for every company. While developing a custom mobile app, the designer may get too caught up in creating an attention-getting program and lose sight of business practices. This can result in a waste of time and resources as the app may not contain functional practicality for your needs and will not be of much use. First and foremost, the business case for each feature is key. An unattractive app that suits the needs of your team is much better than an attractive one that serves no purpose other than looking impressive. Security can be a disadvantage with Mobile BI use since smaller devices are used, which contain imperative data integral to business operations. For example, if a smartphone is lost or stolen, someone could hack the device and bring destructive activity to a business which could result in a financial catastrophe. Potential costs for maintaining security for mobile devices should be factored in when considering Mobile BI for a business. The cost of Mobile BI should be weighed in order to justify the high expense which it can accrue. What are the advantages and likelihood for increased profitability for your company? How will it impact your bottom line? For some companies, adopting Mobile BI is advantageous, while to others, it may make little to no difference at all. 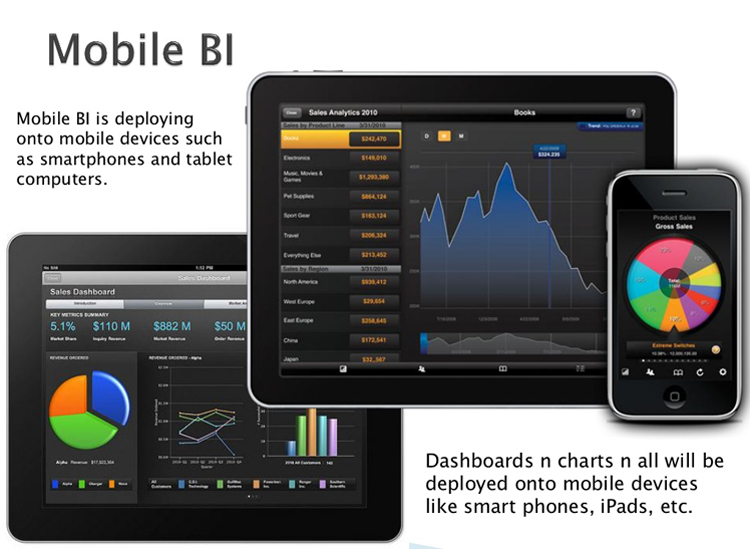 Another consideration is to examine if Mobile BI will work well with the applications your business is already using. Will it comply with the digital workflow? Which of your employees will benefit the most from using Mobile BI? The answers to these questions will help you determine the best way to design and deploy an effective mobile business solution that will serve to enhance your business in short and long-term projections. Countless and massive volumes of big data are generated 24 hours a day. Businesses have developed practices to capture all of this beneficial information to enhance their profitability, however, this type of innovation does not come cheap. There are more cost-effective avenues for staying within budget, yet the old adage of getting what you pay for rings true. Executives must weigh the pros and cons associated with Mobile BI, such as the ability for Mobile BI to interface with company applications already in use and one of the most important elements – data security. When designing mobile data, visual presentation is an important factor as whatever appears on smartphones or tablets can appear much differently in a different context or environment. Applications on mobile devices often remain the same, with little, if any variation. Actual mobility of data is only truly mobile if we are able to reach the core and come back to the application. Mobile devices are here to stay. As a whole, society is in constant motion and we are able to generate instant results in the continuous manipulation of data. Our mobile devices have made it easier to do business with different countries in real time. With a simple touch on a screen, we can connect immediately with colleagues and consumers in all corners of the world. As such, the world has become a much smaller place and Mobile BI is responsible for many innovative practices in the competitive realm of business. By the year 2020, Mobile Business Information will be a household world with traditional business protocols of executives meeting in a boardroom for high-level decision making or sales executives travelling from city to city to promote company products will soon be a relic of the past. With the swipe of a finger on a touchscreen, deals will be brokered and profitability impacted by this exciting and efficient tool in the realm of information technology.